What Door Do You Think Your Getting? They have his door deposit, still does not have his door he was promised, keep changing the ship date. Trying to make him happy by offering a coupon on his next door purchase .. when he doesn't have the first door! Bad Business Trick! Little do they understand.....Never gonna get another sale from this guy... He's pissed.. He needs the door. 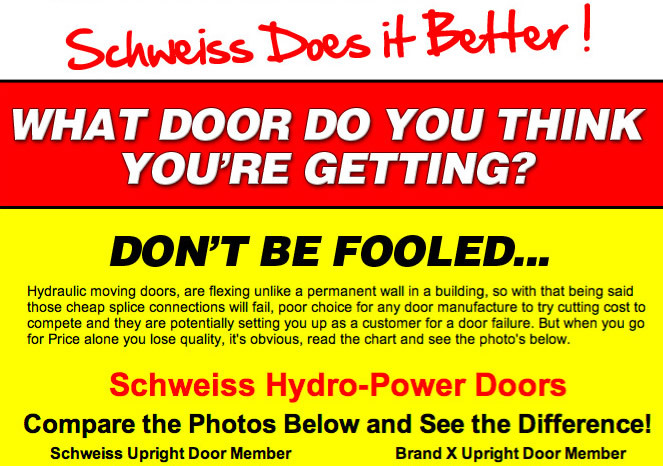 His next door will be a Schweiss Hydraulic Door period! which is so unprofessional, and all the chiefs are out of the country, all correspondence must be done by E-Mail...Where's the human element in this picture??? To keep a happy customer, he needs the truth and good service and have the owner come forward! Some customers never realized they may be getting a cheaper door. Never pay 50% downpayment...25% is good enough! Business Lesson #1....Never "Rob from Peter to Pay Paul"
Be careful who you send a door deposit to these days! To limit your risks ... Pay No More than 25% Down. Why should another company be using your money while you're waiting for the door. Have the right to cancel order...when the ship date is not honored. No exceptions, with money back, demand full refund. When companies sell for cheap and take the metal out of the door...customers are not happy! A cheap, lightweight door may cost you more in the end. Customers want to speak to the "Owner" ...When things go bad...Get the cell number! Do they have a history of door failures...?? If so send me some of the names. 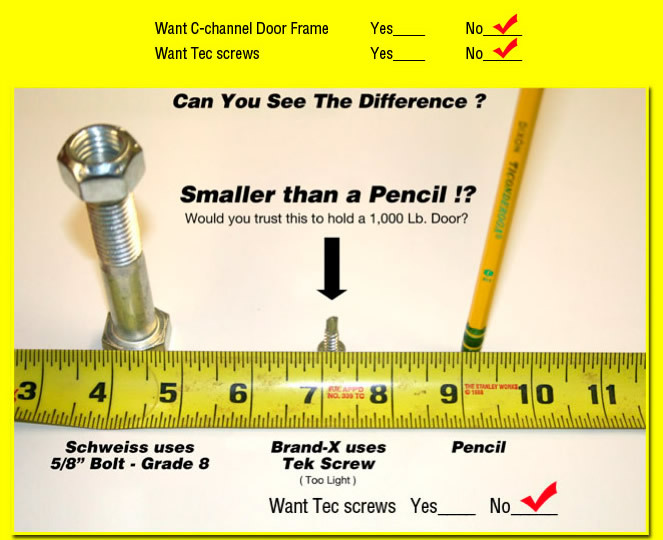 Are DOOR FAILURES posted on the web site? Do the cylinders break or bend? Do the cylinder brackets tear off the doorframe? How long does it take to repair a broken cylinder bracket? Does the building company repair the broken door bracket? Do you have a 24 hour repair team on staff...How many fix-it trucks? problem go back to the cylinder manufacturer. Do you send a fix-it kit with each new door... or do you order it later? shipped back to the factory to get an engineering team to assess the problem? P.S. The building is rented out for big money and do not want to lose the tenant. The cylinder brackets broke twice now... HELP ME!!!! Tells you that you're getting the best door on the market! Cheap C-channel frame & splice connection... using small tec screws. Hydraulic doors manufactured like this should not be allowed! Are slipping the customer a lightweight door... Just to Cut Costs! That's scary when others are using a C-Channel lightweight frame. Check it out! A large moving one-piece doorframe is no place to sacrifice quality. Schweiss uses a 2"x4" rectangular tube, with bolted connections. Say they have bolted connections for easy assembly! What they forget to tell you that all the bolted connections must be field-welded. Why would anyone provide bolted connections that also have to be field-welded? Seems like the engineering department made a mistake again. With marketing hype and prices! 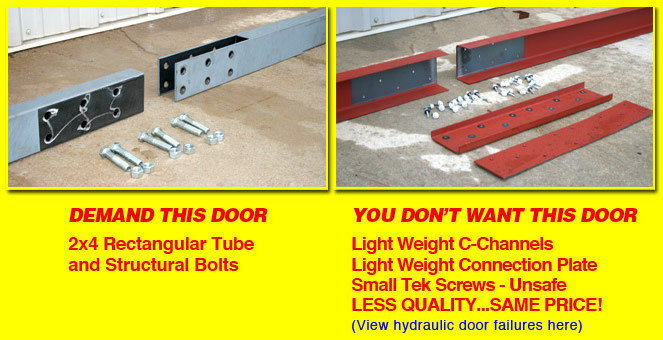 Here's how it usually goes, good door price, lower quality door using c-channels and small tec screws for the splice connections, with high freight rates. Now it's not such a good deal! Top things off by getting shoved a cheaper style door, when you thought it was the best, and the door design has changed... Who loses? Claim to have no competition!!! We agree we have heard this before,. They're in a league of their own when they start sacrificing strength, removing steel using tec screws in the splice connections. Allowing the use of "restrictors" in each of the cylinders. If a hydraulic line would break: The Door is Coming Down - Old School system, Very Unsafe. Schweiss has a Velocity Fuse on each Cylinder, so the doors CANNOT ever go down and close by themselves. If a hose or tube is broken, the door will stop immediately. Safety Built In! Schweiss is better than that! Over 30 years in the door business to prove it! The Questions You Need to Ask... Learn More!